No full analogues. According to the action can be considered an analogue Triderm . : 576 р. 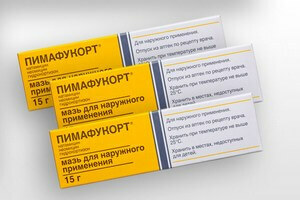 Average online price * : 576 r.
The drug Pimafukort is a combined tool that is used only for external use. Available in the form of cream and ointment, which have a similar effect, but are absorbed into the skin at different speeds. Hydrocortisone helps reduce itching and inflammation in various types of dermatosis. Neomycin and natomycin have low adsorption capacities if the skin area is intact. If there are wounds or ulcers on the skin, the level of suction increases significantly. As for hydrocortisone, the substance is also absorbed better if applied to damaged skin. If the skin is not damaged, then the absorption of the drug is 1-3%. In the treatment of skin eczematous manifestations, the absorption of the drug increases by 2 times, i.e. 2-6%, with infectious skin lesions - 4 times. 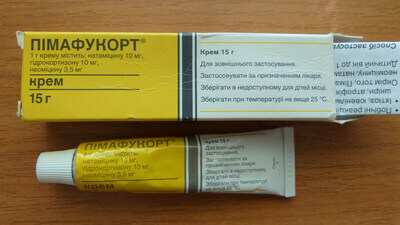 These components of the cream, interact well with each other, as a result, Pimafukort is often used in dermatology. It is worth noting that the absorption of hydrocortisone in children is much higher than in adults. dermatoses that have not yet affected the deep layers of the skin, i.e. superficial, infected with fungi and bacteria, possessing high sensitivity to antibacterial and antifungal components of Pimafukort. The structure of the cream is uniform, white, possible yellowish tint. The tube is protected by an aluminum membrane. Pimafukort is on sale in a cardboard box, the instruction is attached. The cream is used to treat acute dermatosis. If the dermatosis is chronic, then the use of an ointment is recommended. If an occlusive dressing is necessary or dry skin is observed, then an ointment is also prescribed. Pimafukort in any dosage form of release must be applied to the damaged area of ​​the skin or mucosa from 2 to 4 times a day. Such use is the same for adults and children. However, children can not do occlusive dressings and apply the drug on a large area of ​​the body. In the treatment of otomycosis, the drug must be introduced into the damaged ear canal. The use of the drug in pregnant and lactating women is not contraindicated. But it is important to consider that the antibiotic that is part of the ototoxic effect, therefore, like children, pregnant and lactating women can not be used for dressings and applied to a large area of ​​skin. In the first days of use, exacerbation of the disease is possible. If the drug has been used for a long time, stretch marks may appear on the skin. In extremely rare cases, rosacea-like, perioral , contact dermatitis, depigmentation, hypertrichosis, thinning of the skin, telangiectasia can develop. All listed side effects may occur for a short period of time. In children, side effects may occur when applied to a large area of ​​skin, due to the absorption of an excessive amount of a substance such as hydrocortisone. These cases are not recorded in medical records. Cream - stored at a temperature of 25 degrees. Shelf life is 5 years. 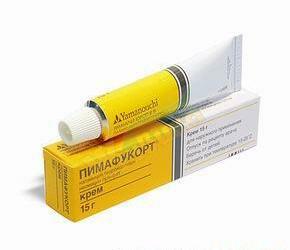 Ointment - to store at a temperature of 25 degrees. Shelf life is 3 years. Ointment and cream is released only by prescription. Last spring, my daughter (she was 5 years old) suddenly had some kind of irritation with crusts, which she fiercely combed. 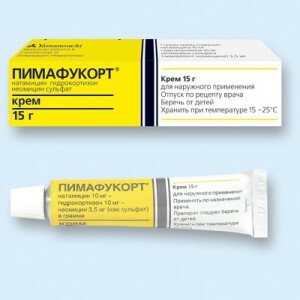 The pediatrician gave a referral to a dermatologist and said while you try pimafukort (write ahead for 2 weeks). For 3 days the child was normal). When we got to the dermatologist, he did not see the manifestations and said that the appointment was correct. Since then, the medicine is in the medicine cabinet just in case, but there were no repetitions.